We are all prey to the ad image of us and so madly and stupidly follow them. The beauty industry is perpetuating more stereotypes than even society has done. today it is life imitating art sadly and not the other way round. This is a wonderful 10 line poem, where the content speaks volumes. Simple living high thinking. This was what, was taught in school. I wonder if they teach the same now as well? Could not agree with you more, Arti! Valli, it is not the appearance but the deception which is behind the appearance that is the cause of concern! People think being simple means lack of something... but they unaware that we enjoying life at least with experience at large. Few restrict themselves to not let down and what seeing from high is a unclear picture of life down to earth. I really miss laying down on earth listening to tiny species of lives... Nice one buddy! 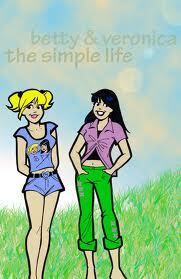 The pic is so interesting...I always preferred Betty to Veronica coz she was a better person. Loved the line: "Is it a sin to live life simple''. In this era of quick fame, nobody wants to live a simple life. But the most satisfying, beautiful and content life is the simple life as it has no false, shortlived mirages in it. Very interesting post. You have a great blog and I like your writing. I would like to give you the award of ‘The versatile blogger’. To receive this award you have to link back and follow the simple rules. If you don’t believe in these awards, then you can ignore this. However I just want to let you know that I genuinely like your writing. Ekta, you are so sweet to have heaped so much praise and an award too:) I am just 8 months into blogging and have come across some very creative people! 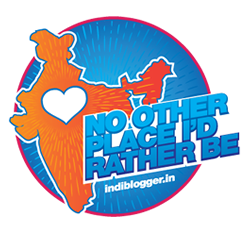 Your blog also happens to be one such and hope to see you here more often! Wonderful poem dear Rahul, yes, please, bring the simplicity back into life, good manners and genuine kindness. So I wish too, Dianne! Thanks! So true! Your poem says it beautifully. What more can I say? A huge thanks, Rachna for those kind words! Natasha it is very nice to see you back after a while and probably your comment is something which I must preserve!A big..g thanks! Very true!Nice poem,sums up the new age scene. Good to see you after a while, Sharmila and a big thanks for that nice comment! True.. very simple lessons for life that can make a difference and ensure a lot of happiness. We should read it out every day morning. I know people make things too complicated! People have forgotten how to lead a simple life and today it is very difficult. Materialistic life has gone a bit too high. Every bit of what you say is the truth , Juhi! A big thanks for liking and I too miss Archies, Dennis, et. al. I think, many peple want to live a more simple life - difficult to achieve though in our times, but worth trying! Happy week to you! I want to live a simple life and I am trying to do so!! A big thanks, Francesca. I know most of us try hard to do so! A simple heart with unshakable principles earns genuine respect from all. I too like people who lead a simple life or follow the adage simple living and high thinking. simply worded and highly potent poem reflecting the meaning of the poem. It's more like a prayer, we should read every day. Somewhere in these modern times , we certainly have lost the simple life we had. In my younger days we simply landed up at any friend's place without informing them, and we would be gladly welcomed by them too. Life was simple we shared our thoughts over a cup of tea, and some short eats, or just had some gupshup with oranges to keep us company. We neither had telephones, TV, or any such fundas, in a jiffy we could plan and go to some movie or go shopping. People were like that: simple and friendly. However, now with changing times we too have become very particular that, people should call before they come, and we too always call and only then go to friend's house. So much has changed, and i think it does make sense to change with time, and okay to call up before landing anywhere, for we don't have the excuse that we have no gadget to communicate from. Thank you, Ashwini for those words:)Own happiness with simplicity is any day more satisfying! Very nice poem. Sometimes, the need to keep up with your peers gets to you and you falter. Lovely! Living a life of kindness is probably the best kind of life. it would be a bliss to live a simple life again .. Thanks a lot, Bikram as I agree with your take and we see others as a mirror of what we are:) I just kept the glamour quotient from Archies! Welcome to my blog, Chilicool:) A sincere thanks and look forward to seeing you more often! Thank you for your kind comments, have a wonderful and relaxing weekend! Beautiful inspirational piece. Thank you Rahul. Thanks a lot PN for those words! Once upon a time there was no technology, people were simple, had simple lives.. Enter technology to help people live even more simpler life.. Ironically, life became complicated! Thanks Binu, for bringing things in perspective! Great words and I love the image. Lovely!! Welcome to my blog, Saumya! I am happy you liked it:) Hope to see you here more often! A big thanks, Jyoti for liking! Saru, you somehow echo my feelings! Modesty is the word which the world seems to have forgotten! A laden tree always stoops down! Aweinspiring verses.Made me remember this line by Leonardo DaVinci ,"Simplicity is the ultimate sophistication." A big thanks, Kavita ! That quotation from Leonardo DaVinci adds value to this humble post! hello mr. bhatia! I landed onto your blogpage since you had commented on someone's blog! and I liked a couple of lines from this poem! I got a funny thought to translate them to Hindi and I got this as output! Selfpromotion - do u mind visiting my page as well? http://jkhona.wordpress.com am hopeful of keeping you glued up there!